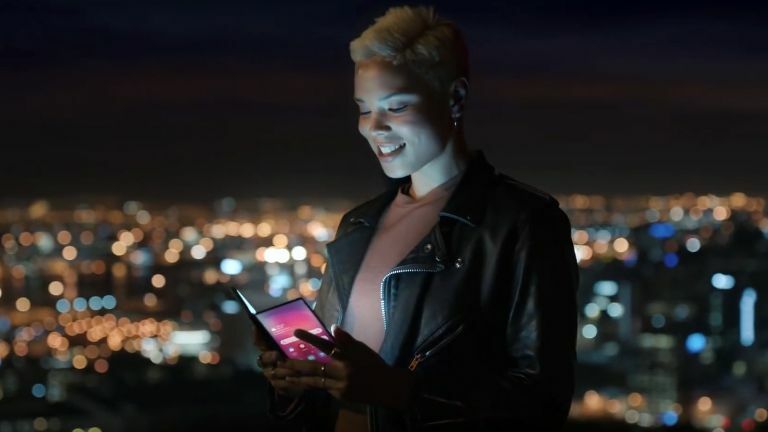 The Samsung Galaxy X folding phone, in someone's hands, being used in a official video. HYPE! Mere weeks before Samsung's Unpacked event an official video has dropped from the South Korean tech giant that shows a folding Samsung Galaxy X style device in use. The official video, which was originally spotted by XDA Developers, appears to be a teaser video for a Samsung event or show, and was originally posted on Samsung Vietnam's official YouTube channel, only to then be hurriedly removed. Luckily, this occurred only after the video was spotted and downloaded, because that's what happens on the internet. The video shows a folding Samsung device that can be used in mobile mode (you can see a typical Android home screen), with a thin-bezel design seemingly granting the device a very big screen size, as well as in a fold-out tablet mode, with the screen bending on a vertically orientated central hinge. What you can't see from the video is what its user is looking at when the folding phone is opened up into tablet mode, however it isn't too much of a jump of the imagination to envisage more of a Samsung Galaxy Tab S4-style home screen, geared toward a tablet form factor. What's particularly exciting is that the device shown in the video seems way in advance of the prototype folding phone that Samsung showed off at its annual developer conference last November, which seemed much thicker and had much larger bezels, too, but then as Samsung said at time, that prototype was heavily disguised. Crucially, though, and another reason why we think that the device in this video could very well be the unannounced Samsung folding phone is that the design, despite getting better, remains fundamentally the same. It's as if Samsung has just worked out all the kinks and streamlined the same piece of hardware. Will we see the Samsung Galaxy folding phone at the maker's Unpacked event on February 20, 2019? With only weeks to go now until Samsung's big Unpacked event, which is where the Galaxy S10 smartphone range is set to be announced, this latest look at the folding phone everyone has been talking about has set T3's hype-o-meter to maximum. Whether or not the folding phone shown here will actually be launched remains to be seen, but it would be incredibly odd for Samsung to tease such a device, which is shown to be real and in a user's hands, only for it then to never see the light of day. The idea of getting hands on with a folding Samsung device like depicted in this official video is a tantalising prospect and it would make Mobile World Congress 2019 a show to remember.